Orange Drive Hostel v Los Angeles, USA: Zarezervujte nyní! Los Angeles, such as the world famous Chinese Theater, the Hollywood Walk of Fame, the Dolby Theater- Home of the Oscars, The Hollywood Bowl, Sunset Blvd, Jimmy Kimmel Live Studio, Disney’s El Capitan Theatre, Madame Tussauds Wax Museum, views of the Hollywood sign, Runyon Canyon, a favorite hiking trail of celebrities with fantastic views of the city and the Hollywood Sign. We are also just steps from public transportation, the best night life, shopping and restaurants in Hollywood. And just a short drive or bus/metro stop away from Universal Studios, Paramount Studios, Warner Brothers Studios, West Hollywood, and Beverly Hills! We offer a variety of room types, including dorm rooms, private rooms, and group rooms. For your safety, our staff remains on the premises at all times and we have a state of the art video security system. - Free basic breakfast of all-you-can-make waffles, pancakes, oatmeal, coffee, assorted teas and hot chocolate. Orange Drive Hostel was originally a manor home built in 1910. It later became a boarding house for the stars of Hollywood's Golden Age, including Marilyn Monroe, Gary Cooper, Rita Hayworth, Kim Novak, Douglas Fairbanks Jr, Johnny Weismuller 'Tarzan, and' and many more. 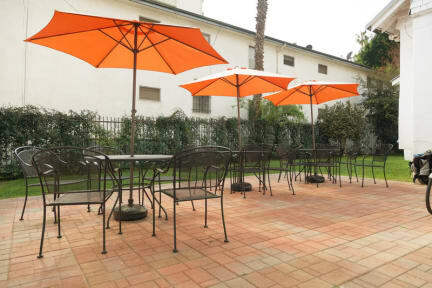 Orange Drive Hostel is a historic home filled with Hollywood history, and staying with us offers a unique opportunity to experience the Golden Age of Hollywood. Additional key deposit is required and is refundable upon checkout. Please contact hostel if travelling with children or more than two guests/extra charges may apply.